Because positive press exposure is commonly recognized as one of the best ways to promote your business, products and/or self; you may be wondering how to get press coverage. There are basically 4 ways to get press coverage and one is considerably more effective than the rest. It’s also the most expensive and in my opinion the best option to promote your business and position yourself as an industry expert. The others are less effective, take more time and a risk that you may not even achieve your desires results. This is without question the least effective strategy; obviously. However, this also the most employed strategy. Most business owners and professionals just show up and grind everyday never really thinking about getting press, but deep in the back of their minds they hope someone will appear and be amazed at the work they do and will want to do a story about them because they are so amazing and then their business will explode with new clients wanting to pay them more money for their help while they heap admiration upon them. As you know, it doesn’t really work that way. You could do something truly sensation. News outlets thrive off of sensationalism and conflict, which unfortunately isn’t necessarily always good for your business. You could help a massive amount of people; maybe for free. That would qualify as sensational. I’m sure you can see the problems with that. It could cost a lot of time and money and there is a possibility that, no matter how sensational, no one will care enough to give you free press coverage. You could contact journalists. Although a few years ago your best options for contacting journalists was through lists (you could purchase a list or create your own and send your story to as many as possible hoping to get lucky and have it picked up )and relationships (you could develop relationships through your network or local and hope someone found your story newsworthy), today there is a website called HARO that is way less time-consuming and way more effective. HARO stands for help a reporter out. It’s a website that journalists use to find people to interview for upcoming stories. You simply sign up for their newsletter and read it daily to find a journalists who you can help. You would then contact them and maybe they could use you. This method does work, but it does consume your time and, again, there is no guarantee of results. This is the do it yourself press coverage method. Today, news media outlets are hungry for quality content, so give it to them. Simply write, or have written, a press release or news story about you or your products, and pay someone like me to distribute it to the news media outlets. The option of using free distribution services exists but, once again, time-consuming with no guarantee of success. If you are just starting out and/or on a budget I recommend using my DFY Press Release to get your news distributed on national news media outlets including ABC, CBS, NBC and Fox affiliates. You also get Yahoo and Google News. This gets you national new media exposure and an authority status upgrade at an affordable price. For increased distribution, including to a list of journalist, I recommend my DFY Press Release Pro. If you want to write the release yourself and just want distribution, choose my Syndication Pro offer. If you have a larger budget and understand the value of leveraging advanced positioning techniques, then the Authority News Release is for you. You can check out the details and pricing of the plans here. Feel free to research other press release services but you will likely find nothing better. 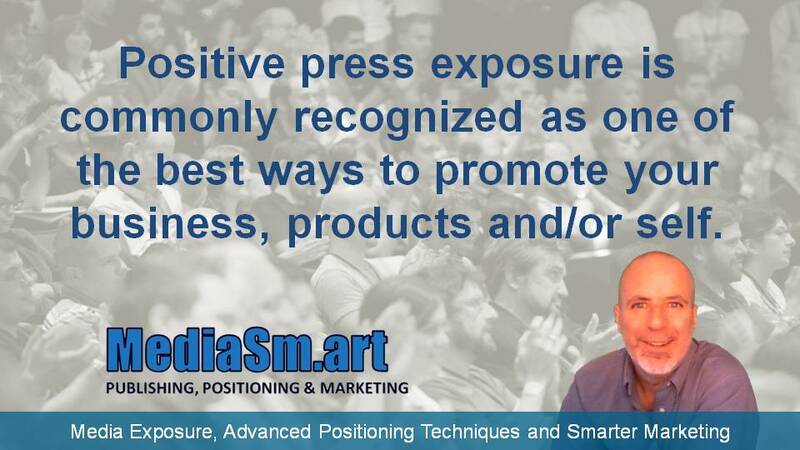 In conclusion, positive press coverage is one of the best ways to promote your business, products and/or self. You get brand awareness, authority positioning, traffic and SEO benefits. It’s really one of the best investments you can make in yourself and business. It’s often the spark for organic press interest. So, now that you know how to get press coverage it’s time to take some action and make it happen.